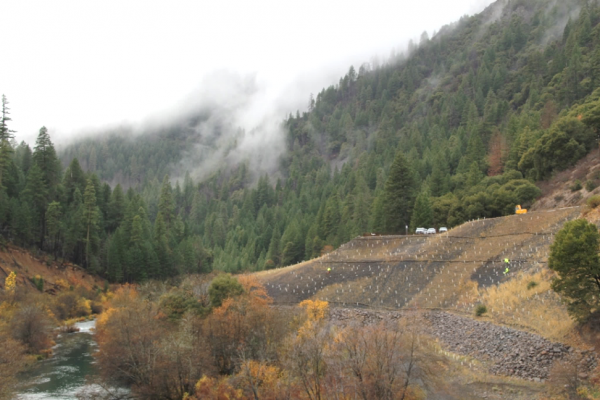 Pit River Spoils Piles Revegetation | Prunuske Chatham, Inc.
As part of PG&E’s federal relicensing process for their Pit River hydroelectric facilities in Shasta County, PCI designed and implemented revegetation of over 20 acres, including three spoils piles, along the river. The sites include montane coniferous forest, oak woodland, and riparian habitats. The spoils themselves are very steep rock piles placed decades ago. Although the piles are surrounded by relatively intact natural habitats, they have never substantially revegetated due to harsh conditions. PG&E’s project goals include pile stabilization, improvement of scenic and habitat qualities, and prevention of invasive species spread. PCI has worked since 2009 on the project. 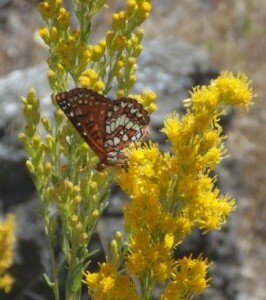 Accomplishments to date include on-site seed collection of a diverse suite of plants; development of site-specific plans acceptable to both PG&E and the US Forest Service, which owns some of the project lands; devising special planting methods for the remote, steep, loose and rocky setting; installation of thousands of native shrubs and trees; and installation and maintenance of extensive drip irrigation systems. Woody plant survivorship rates have exceeded project targets.